What Goes Into a Comprehensive Dental Marketing Plan? 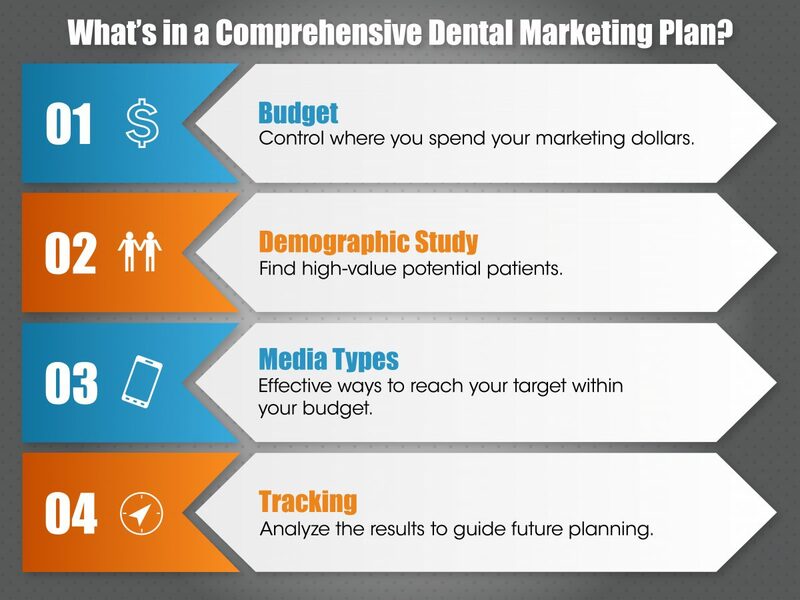 A comprehensive dental marketing plan starts with a marketing budget. The budget will allow you to control where your marketing dollars will be spent. The next step is a demographic study for the area around the practice. This tells you where the high value potential patients are located. We use various selection criteria such as distance from practice, physical barriers (rivers, lakes, etc), creditworthiness, and household income among others. Then in accordance with the practice marketing budget, we choose the vehicles/media we feel would be effective in reaching these people within the constraints of the budget. It could be mail, Ad Word campaigns, radio, TV, billboards, internal marketing, signs, print ads, Facebook, website or SEO creation or improvement, or a combination of several mediums. The dental marketing plan would also include a way to know if it’s working or not. This could entail call tracking, Google Analytics, Ad Words dashboard, or, in the case of mail, cross checking the new patient roster with the mailing list. Give the dental marketing plan sufficient time to gain momentum and adjust as needed. Need help? That’s what we’re here for! After a 15-minute survey that helps us learn about your practice, we will put together a full marketing plan with an actionable to-do list, budget, demographic study, and more.